Posted October 16, 2014 by Michael Kelly, GIY Ireland in Features. With Halloween soon over, the countdown to Christmas is truly on, and as a result we have turkeys back in our garden again. Each year we rear about four turkeys, with one becoming the centrepiece of our Christmas Day celebrations, and the balance jointed and put in to the freezer. It’s an arrangement that has worked well for us for a number of years now, providing some amazing fresh meat at a time of the year when we’re really focussed on eating food from storage. I love keeping turkeys for the same reason that I love making Gravad Lax for Christmas (to the point that it’s a bit of a running joke in our family)—I love putting all that work into a single meal. It seems to make the Christmas dinner all the more special—and of course the fact that the turkeys are out and about in the fresh air, with unlimited access to grass, makes the meat particularly delicious. What could be better than sitting down to a Christmas dinner that has been reared in your own back garden? They are very fine birds indeed—two regular white ones and two bronze. 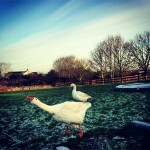 Though in a separate house, they are sharing a run with our hens and ducks. It’s not generally considered such a good idea to run turkeys and hens together, with the risk of the transmission of blackhead (histomoniasis) between them—but I am willing to chance it given the relatively small amount of time the turkeys will be here. The first day we let the turkeys out in to the run, the hens and ducks spent a few hours cowering underneath an old trailer, worried about these strange new intruders in to their little universe. 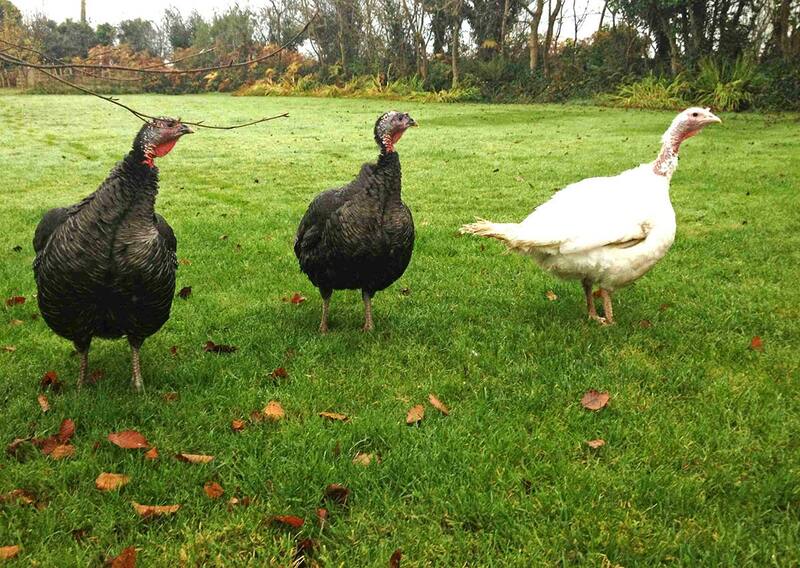 But by now, they are getting used to each other (though the turkeys are definitely the boss). Turkeys have some unique characteristics when compared to hens—there are all those wonderful gobble-gobble sounds for one thing. While hens head for their house as soon as it gets dark (so there is no rounding up to do), turkeys are far more interested in roosting in a tree or on top of a wall. Each night since we got them, we’ve had to lift them down from a tree or some other lofty perch, and put them in to their house. Incidentally they are far easier to handle than hens—they seem to like human interaction. 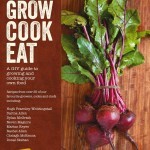 Our brand new grow/cookbook, called Grow, Cook, Eat (A GIY guide to growing and cooking your own food) is out now. 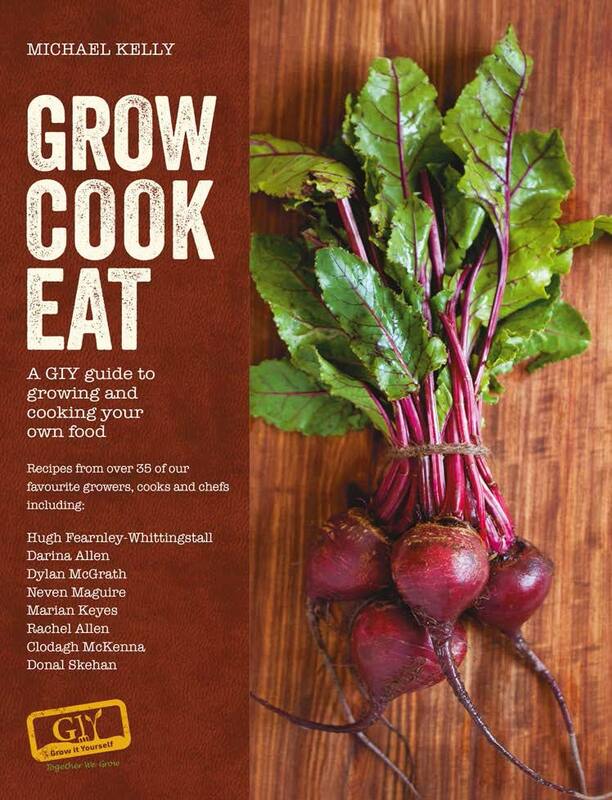 Written by yours truly, it features seasonal contributions and recipes from over 35 of our favourite chefs, cooks and growers including Hugh Fearnley Whittingstall, Dylan McGrath, Donal Skehan, Darina Allen, Neven Maguire, Rachel Allen and Clodagh McKenna. Available from all good book stores and from the GIY website at www.GIYireland.com. RRP €25. 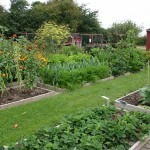 Do not leave beds bare for the winter—sow a green manure, or cover with a thick layer of manure/compost and then black plastic or straw. This will return nutrients to the soil, keep the worst of the weather off it, suppress weeds and prevent leaching of nutrients. Earth up or tie up vegetables such as cabbage, cauliflower and Brussels sprouts. Divide up your rhubarb if you want to propagate, and cover it with a thick mulch of manure. Prune apple trees. 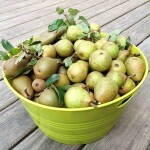 Mulch fruit bushes. Take cuttings of currant bushes from current season’s wood. Sow broad beans outside now for an early crop next spring. To avoid rotting before germination, make small newspaper cups and germinate them indoors first. Next summer’s garlic does best if it’s planted before Christmas—plant outdoors in well prepared soil in a sunny spot. Though I have to admit I never bother with them, some varieties of onion can over-winter and will be ready to harvest in early summer. This is a super-quick, healthy kale recipe from Café Paradiso’s Denis Cotter. Serves 4. Bring a deep saucepan of water to a rolling boil and blanch the cavolo nero for one minute. Drain, and when cool enough to handle, chop finely. Heat the olive oil in a wide pan and fry the cavolo nero in it for a few minutes, over a moderately high heat, stirring constantly. At the same time, bring a pot of water to a boil and drop in the pasta to cook for two or three minutes until just tender. Drain the pasta and stir it into the kale with the lemon zest and juice, the chickpeas and half of the grated pecorino. Season, to taste, with salt and freshly ground black pepper. Serve the pasta in deep bowls with more cheese scattered over. You can and should divide rhubarb plants every four or five years to give the plants more room and reinvigorate them. The best time to do this work is when the plant is dormant so November to February will work. Dig the rhubarb using a fork to lever the crown carefully from the soil, trying to avoid as much as possible damage to the roots. 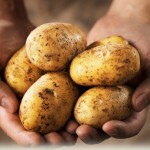 Once you have it out of the ground remove any rotting sections from the plant and give it a general clean up. Then using a sharp spade, press down heavily and divide the crown in three. Ideally you want each section to have a crown, a large amount of root and at least four or five pink buds. Then dig a hole for the divided crowns and place one crown in each roots downwards, with the top of the crown roughly an inch below the soil surface. You can pop some well rotted manure or compost in to the hole first if you want to add some nutrients. Backfill with soil, firming in gently. New plants shouldn’t be harvested too heavily in the first year. Grow, Cook, Eat is a book for anyone that wants to develop a deeper understanding of food, packed with advice on setting off on your ‘good life’ journey; including what to do in the veg patch each month, and seasonal recipes to turn your produce in to delicious home-grown meals. Where Oh Where Did January Go?